Firstly, let me start by saying a massive ‘HIYA’ to all of you who read this blog! Alex has asked me to babysit this while she jets off to the US for a well deserved break. I’ve never blogged before, so bear with me! Right, well, I’m Halimah. I started in head office last October in the Product Development department and I can’t quite believe it’s been nearly six months – has FLOWN by so quickly. 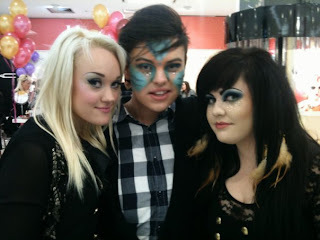 Some of you may already know me as one of the original Selfridges make-up artists! Here’s a pic that Alex snapped of me yesterday in my fetching ‘Zombie Bunny’ (note bleeding, dangling eye on the left) dress that she loved! OK, enough about me and onto some ‘Director’s Cut’ winners from last month that Alex dug out for me. Well done team Cardiff! I received these stunning pictures, featuring (L to R) Tamsin, Clayton and Charlotte. Well done guys, I’m sure you turned many heads in Cardiff! 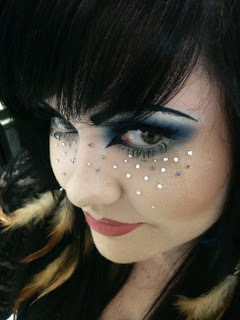 I absolutely love Charlotte’s fantasy twist on her brilliant make-up using the diamantes.